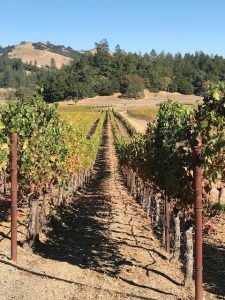 Just two short weeks after the unprecedented California wine country fires, our traveling wine group headed out to Sonoma for our fall trip. We debated going, of course, as some fires were still burning and every day seemed to bring a new situation. But in the end, we went –and we couldn’t have made a better decision. 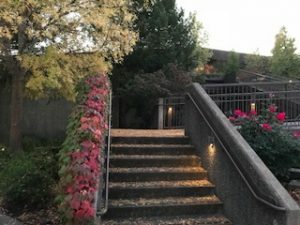 What we found was the same stunning countryside with the warmest of welcomes by all of the wineries, hotels, and restaurants who anxiously need visitors to return. Yes, there was some evident fire damage in places. Sporadic hillsides were charred and random commercial and residential areas were razed to the ground with untouched green vines swaying in the breeze just a few feet away. It was hard to comprehend the sheer randomness of the fire’s destruction and our hearts went out to all that lost something or someone in this horrific event. We all wanted to help and as the trip progressed, we came away resolute in the fact that tourists going to visit is the best thing we can do to honor and support everyone who’s trying to rebuild. So, if you have a trip planned – go. And if you don’t, consider planning one. There are few things more tranquil than a vineyard in early winter and there is availability in hotels, wineries, and restaurants that isn’t always there so it’s an optimal time to visit and drink some fantastic wine. Sonoma is also a jewel of a wine region. 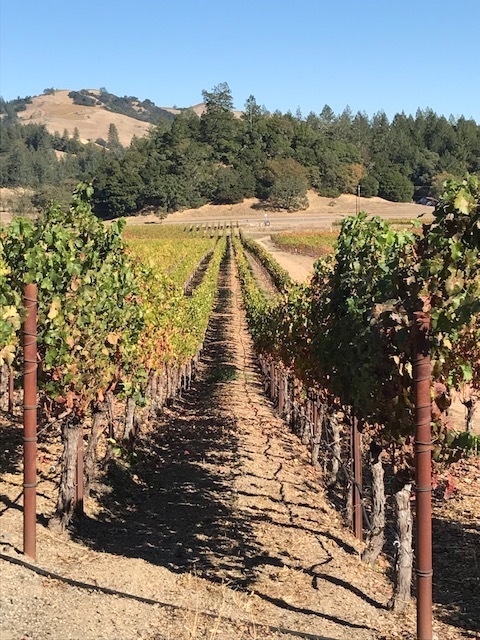 Lower key and more casual than Napa, its wines shine on their own merit with greater diversity in grape varieties due to the larger area and varying microclimates. 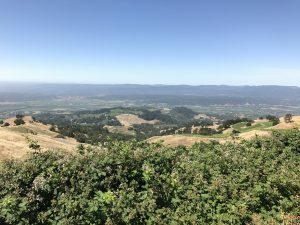 There aren’t many places in the world that can grow quality Pinot Noir, Chardonnay, Zinfandel, and Cabernet Sauvignon in the same region like Sonoma can. 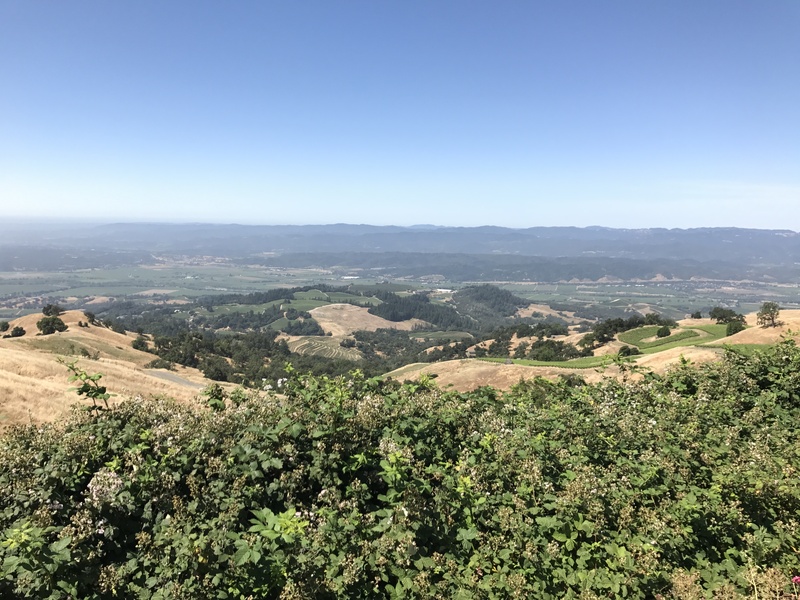 We visited an incredible line-up of wineries each distinct in its own way starting with Sbragia Family Vineyards which offers gorgeous views in every direction, a wide range of fascinating wines, and a wry sense of humor. 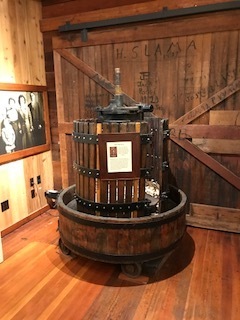 Ed Sbragia says that he’s “always had one foot in Sonoma and one in Napa” as he has long relished the uniqueness of both regions. After 32 years of making wine in Napa, Ed started his own family winery in Dry Creek Valley, Sonoma focusing on his favorite vineyard blocks in both regions. 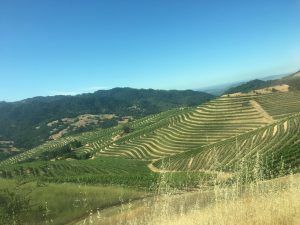 These include plots from Dry Creek Valley, Alexander Valley, and Moon Mountain District in Sonoma and Mount Veeder and Yountville in Napa. Incidentally, Ed Sbragia is the only winemaker in the world to receive Wine Spectator’s “Wine of the Year” award for both a red and a white wine in his Cabernet Sauvignon and Chardonnay. We tasted a dizzying array of wines here which were all special and terroir-driven. One of my favorites was the 2013 Monte Rosso Cabernet District from Moon Mountain District. A smooth and savory blend of 95% Cabernet Sauvignon, 4% Cabernet Franc, and 1% Petit Verdot, this wine spent 24 months in new and used French oak yielding black cherry, tobacco, violet, and earthy notes with a long vibrant finish. The 2013 Godspeed Cabernet Sauvignon from Mt. Veeder in Napa was also exceptional. Made in the same Bordeaux blend as the 2013 Monte Rosso above, this wine was all black fruit (blackberry, black cherry, and currant) with a savory backbone and haunting cedar notes. Firmly structured and intensely concentrated in the trademark Mt. Veeder style, this wine will go a long distance in the cellar. Next, we visited Vérité which is a world-class operation with decadent, ethereal full-bodied wines. It’s not often one gets to try two 100-Point Robert Parker wines in one sitting (let alone ever) so this was an incredible opportunity. Vérité is the French word for “truth”. Sourced from their estate vineyards in Alexander Valley, Bennett Valley, and Chalk Hill, and Knights Valley, Vérité wines channel Bordeaux-style blends and elegance with incredible energy and stamina. The three wines we tried were all truly exceptional with that kind of a “once-in-a-lifetime” taste memory one never forgets. 2013 La Muse (“Inspiration”) - 89% Merlot, 8% Cabernet Franc, 3% Malbec. With dense flavors of plum, black pepper, and mint, this Merlot-driven wine offers layered complexity, firm structure, and an energetic full body. 100 Points Robert Parker. 2013 Le Désir (“Desire”) - 62% Cabernet Franc, 22% Merlot, 11% Cabernet Sauvignon, 5% Malbec. This is an ethereal Cabernet Franc with concentrated notes of red fruit, violet, exotic spice, and a savory spine of earthy tobacco running through it. The plush finish goes on and on. 99 Points Roberts Parker. 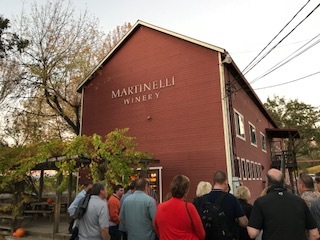 We spent the evening at Martinelli Winery & Vineyards which is bursting with charm and character and located in a historic turn-of-the-century hop barn. The Martinelli family has been growing grapes in the Russian River Valley since the 1880’s. 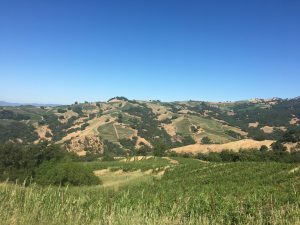 As young teenagers, Giuseppe Martinelli and Luisa Vellutini eloped from their small village in Tuscany and traveled to California in search of vineyard land. Working side by side on a 60- degree slope, Giuseppe and Luisa planted a small area of Zinfandel and Muscat Alexandria vines. This area later became known as the Jackass Hill vineyard because it was said that only a “jackass” would try to farm such steep land. 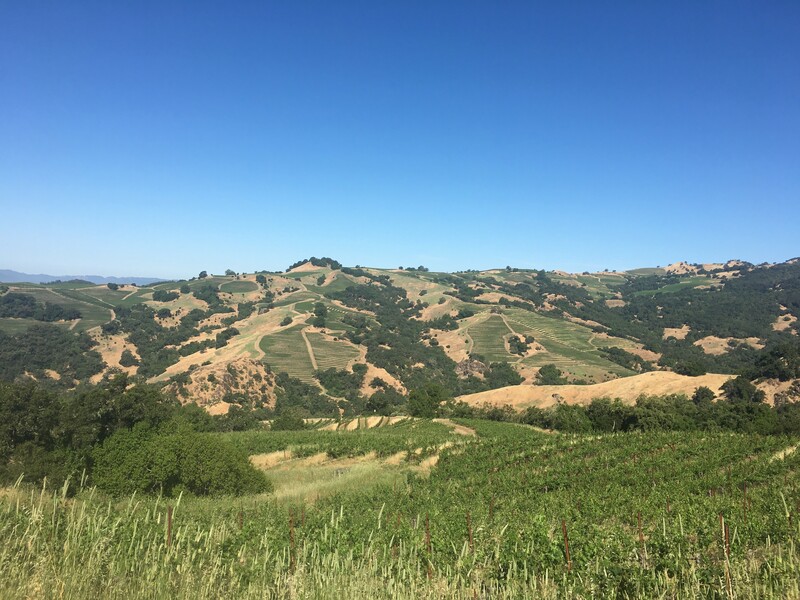 Jackass Hill is the only vineyard Giuseppe planted that is still in production and, over 100 years later, this south easterly exposure remains the steepest non-terraced vineyard in Sonoma County. The winery itself is also worth seeing with its historical setting, old bricks, and museum-like artifacts. A new outdoor veranda is open (complete with heat lamps) set right next to the vines. Specializing in hedonistic Zinfandels, Martinelli also offers elegant Pinot Noir, Muscat, and Chardonnay. We tried several Zinfandels, Chardonnay, and Syrah with the 2010 Martinelli Jackass Vineyard Zinfandel being my favorite. This is a robust, flamboyant wine exploding with black cherry, licorice, black pepper, raspberry, and spice. The 2013 Jackass Hill Muscat of Alexandria was also a standout as it’s not a typical California wine. Muscat is often made into sweeter wines with pronounced fragrant aromas of peach, honeysuckle, orange peel, and apricot. This wine had all of those flavors but with an unexpected clean and dry finish. Fermentation time in neutral French oak contributed to its complexity and medium body. We started our second day at Kosta Browne. With a tag-line like “Obsessed with Pinot Noir”, you get the picture of their commitment and fascination with one of the most finicky grapes around. 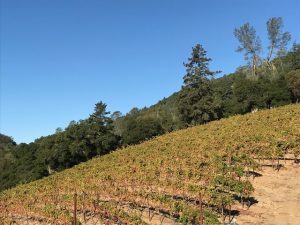 Offering Pinots from multiple appellations (Sta. 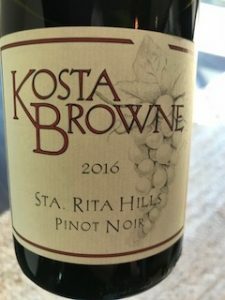 Rita Hills, Russian River Valley, Sonoma Coast, and Santa Lucia Highlands), Kosta Browne has clearly learned how to tame this grape into its many diverse forms..
Two of my favorites here were the 2016 Kosta Browne Sta. 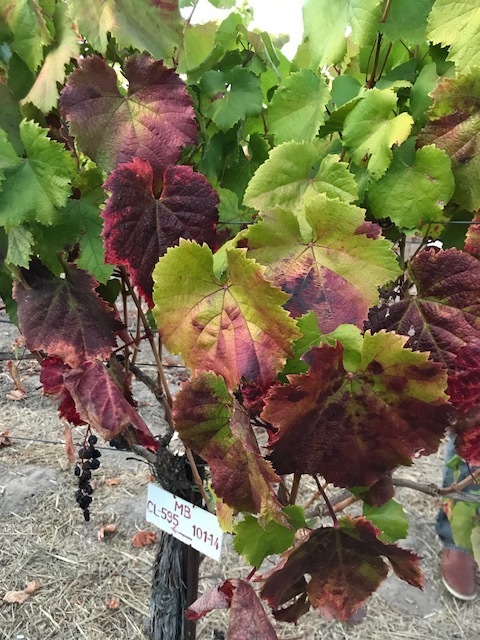 Rita Hills Pinot Noir and the 2015 Gap’s Crown Vineyard Sonoma County Pinot Noir. The Sta. Rita Hills Pinot was elegant and lean with cranberry, forest floor, tea leaf flavors while the Gap’s Crown Pinot was fuller in body with more black fruit and violet aromas accompanied by fine-grained yet powerful tannins. We concluded our Sonoma tour at Rodney Strong which is another fun winery to visit. 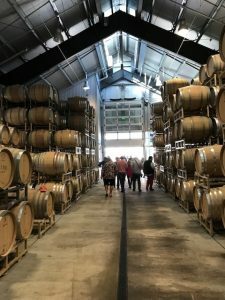 I’d only tried their entry-level wines (which are consistent quality offerings) but they also have a broader range of single vineyard wines that are worth seeking out if you’re looking for something more complex. We tried three of these single-vineyard Cabernet Sauvignons side by side at dinner. All from similar blends, the same vintage (2014), and the same price ($75), this was a true exploration of terroir and how different soils and growing sites yield very different wines. The Brothers Cabernet Sauvignon was the most robust of the three with the Alexander’s Crown being the lightest and the Rockaway lying somewhere in-between. The Brothers Cabernet is made from grapes grown at higher elevation (up to 1000 feet) and loam/sandstone soils. In 2014, these conditions yielded a dense, highly structured wine with plum, cassis, and tobacco notes. The Alexander’s Crown Cabernet comes from valley grapes grown in volcanic soil that receive the first Pacific breezes each day. This elegant wine tastes of red cherry, cedar, and dried herbs with zesty acidity backing a long, sustained finish. The Rockaway Cabernet is from grapes grown at moderate elevation (225-700 feet) and gravelly clay soil. This concentrated robust wine has more black and blue fruit flavors along with grippy tannins and toasty notes. 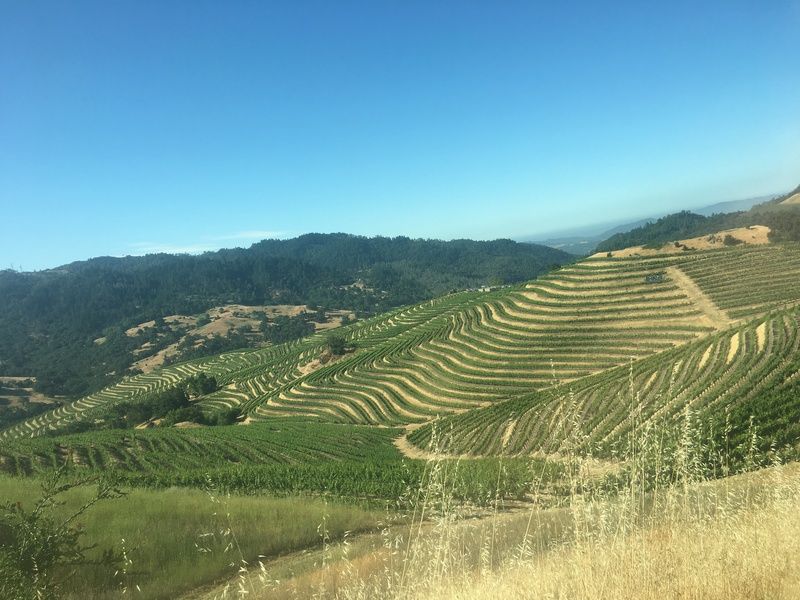 Along with making good wines, Rodney Strong is highly committed to sustainability practices through soil and water conservation, Fish Friendly Farming, and they were the first carbon neutral winery in Sonoma County. These are just a few good places to visit in Sonoma – there are hundreds more in both Napa and Sonoma and it’s a perfect escape during Chicago’s winter months. I'm already planning my January trip to Napa.